To Pick Stocks Or Not To Pick Stocks? Once, I was talking to my uncle about the market, and he challenged me to name something I knew about the market that no one else did. Until I found something convincing, he said, I should buy cheap index funds. I’m not convinced he’s right, and this article is my exploration into why. In a way, it’s my indirect response to Conrado Foglio Bonda’s thought-provoking article. I’ve seen this chart in Bonda’s article and elsewhere on Seeking Alpha, usually to support the conclusion that we would do better buying passive funds than picking our own. I don’t doubt that that’s often true, but that’s not what I take away from the graph. Notice that hedge funds performed only slightly worse than the S&P, and far better than aggregated mutual funds, which are represented as the “average investor.” Dalbar, the company that produces the “average investor” estimate used, concludes that their data is evidence that buy-and-hold strategy far outperforms attempts to time the market. An actively managed fund, by definition, does’t do that. I tend to agree that buy-and-hold is the way to go. It’s also worth pointing out that this doesn’t tell us how actual individual investors perform, since data on individual investors is much harder to come by. Instead, it assumes that professionally-managed mutual funds perform as well or better than actual individual investors, which may or may not be a valid assumption. Bonda quotes Robert Mattei on the theoretical advantage enjoyed by institutional investors; essentially, they have more expertise and research resources than individuals. But I can think of three countervailing reasons that could hinder their performance relative to individuals. First, large mutual funds with billions under management can’t enter and exit positions nearly as quickly as individual investors. Second, institutional investors are accountable to investors every quarter end, which may encourage them to pursue suboptimal long-term strategies. Third, and most importantly, institutional investors are often operating under a set of strict rules that force them into “irrational” behavior like limiting themselves to a certain market cap or country, or selling a high-performer to stay within allocation limits. Since every dollar I make above the market must necessarily come from someone underperforming the market, these relative advantages and disadvantages are critical. Of necessity, index funds contain companies that are in decline, overvalued, or both. In fact, the more overvalued a company is the greater its market cap, and thus, representation in proportional index funds. By picking stocks, I run the risk of picking the wrong companies or timing my picks poorly, but I also can avoid companies I view as poor investments. If I buy and hold sound, growing, wide-moat companies, I should have a substantial built in advantage over index funds, at least theoretically. With the market as high as it is, now is an especially important time to avoid weak and overvalued companies. Can The Market Be Beaten? So, Should You Pick Stocks? Here’s a breakdown of the high growth portfolio, the best performer thanks largely to Sketchers (SKX), though all but Sensata Technologies (ST) have also been pulling on the oars. We saw in the first table that the high growth portfolio has been slightly riskier than the S&P. Stock Rover lets us take a deeper look into the portfolio’s safety by examining the correlation between stocks. Positive correlations are red, negative correlations are blue, and strength of color indicates strength of correlation. We see that Gilead (GILD) and IPG Photonics (IPGP) have helped to diversify the portfolio. Howard has beaten the market 11 of the past 14 years, which certainly suggest that stock picking is viable. Beat the market, adjusted for risk. The first two goals are extremely important to me, and also not that hard to achieve. I could park my money in an inflation-adjusted U.S. Treasury note and call it a day. The problem with that is I’d be sacrificing my other goals. I care very much about doubling my money every 5-12 years, which seems to me a strong but not unreasonable rate of cumulative growth. This is why I put my investable wealth in equities. While beating the market is nice, I care more about realizing an concrete appreciation benchmark than beating a moving benchmark. Finally, there’s my goal of becoming unimaginably wealthy, which is more a pipe dream than an actual goal. If that were my goal, I guess I could get into some more speculative stocks or trade more frequently. But since that requires more risk and time than I want to commit, I’ll stick to a buy-and-hold, growth and value equity strategy. My point isn’t that stock picking is for everyone: it has real costs in stress and time, or benefits in enjoyment and financial reward. 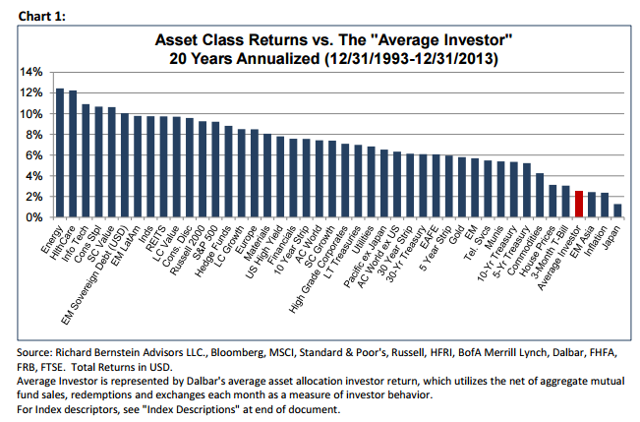 I think passive fund proponents are right that many institutional investors drastically underperform the market. But that doesn’t mean individuals can’t do better. If you’re so inclined, I think there’s a lot to be said for putting some portion of your money in ETFs and another portion in individual stocks and seeing which performs better after 3-5 years.